My son will be one year old this weekend. The time flew by; I can only imagine how fast the next 17 years will go. I found out I was pregnant with him two days after Christmas 2011. After celebrating the news, I began scouring the Internet for advice on exercise. I was already commuting to work by bicycle three to four days a week; my concern was that I would have to stop. In fact, during my first visit with the nurse/midwife, she quipped “We’ll see if you’re still doing that at eight months.” Even my yoga instructor expressed concern when I told her I was 10 weeks pregnant. “By the end of the semester, I’ll probably just have you stand there,” she said. Wow, I didn’t realize that pregnancy was going to have so many limitations. As my pregnancy progressed, I continued to bike to work. I didn’t start to show until I was into my 6th month and even then, I didn’t fully ‘pop’ until 8 months. I continued to bike to work until July (I was due at the end of August) and only put my bike away because I was nervous about sharing the road with out-of-state drivers! (And that was after I completed a 37-mile endurance ride at 6 months pregnant, in addition to 2 5k runs). While I had to alter a few moves in my yoga class, I managed to keep up with everyone else. My point is, if you’re active before you’re pregnant, there’s no reason not to continue your routine once you’ve got a bun in the oven. Sure, you’ll have to make a few adjustments as the months progress and your belly gets larger, but for the most part, you can keep doing what you’re doing. Of course there are exceptions for any health problems that can arise during the pregnancy, and you should always follow your doctor’s orders. And you probably won’t set any speed records. However, I think being active helped me during my pregnancy and alleviated many pregnancy discomforts. 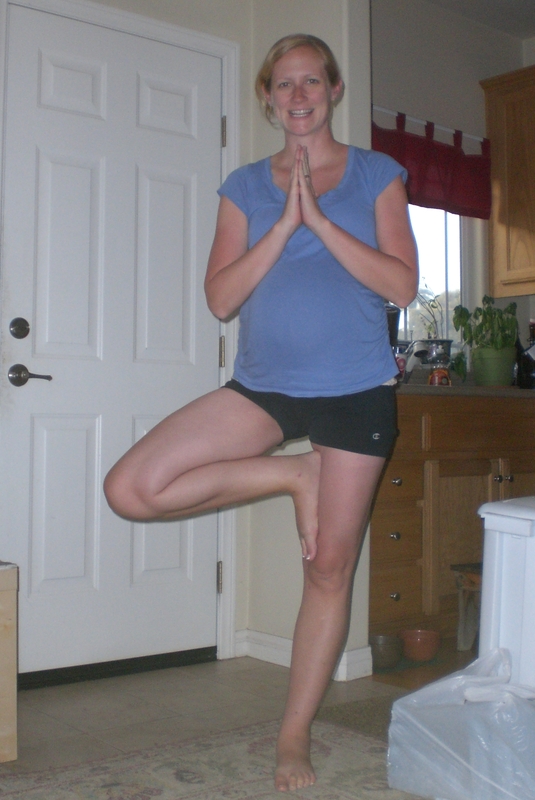 Tree pose 3 weeks before I had my son. It alleviated morning sickness. I felt nauseous throughout my first trimester, even more so on days that I didn’t bike to work. A B-complex vitamin and 30 minutes of exercise kept my upset stomach at bay. It reduced swelling. While the women in my birthing class complained of swelling as early as six months, I managed to stave it off until about a week before my due date. It gave me an energy boost. The endorphin boost and improved blood circulation helped me maintain my pep. It helped me put labor into perspective. Don’t get me wrong—after 30 hours of labor, I begged for the epidural. However, I was able to prepare for labor mentally by thinking of it as a century ride: the first quarter will be manageable, the second quarter will be tiring, the third quarter I’ll hit my ‘wall’ and the final quarter will lead to elation…and that’s how it happened (the final quarter due in large part to the drugs). NextIs There A “Best” Time of Day To Write?